This morning we returned our Prius to Hertz after driving 220 miles and getting an average of 45.6 mpg over that distance. 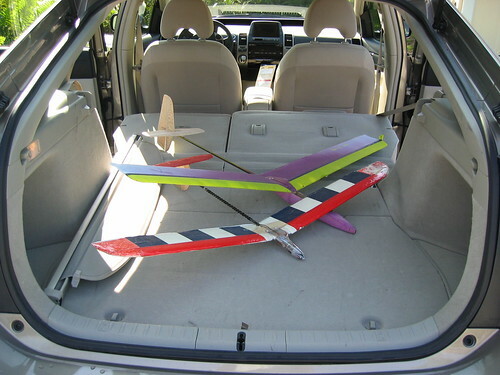 Before turning it in we performed what we call the "glider test" which involves Bob testing the accessibility and usability of the cargo space by loading his radio controlled model gliders. As you can see above there was no problem and the cargo space was larger and easier to access than our PT Cruiser. With the two back seats folded down the cargo area is actually quite large. Back in our PT Cruiser. The seats in the PT are not as comfortable as those in the Prius. It is much noisier than the Prius and of course only gets 20 mpg as compared to the mid 40s on the Prius. 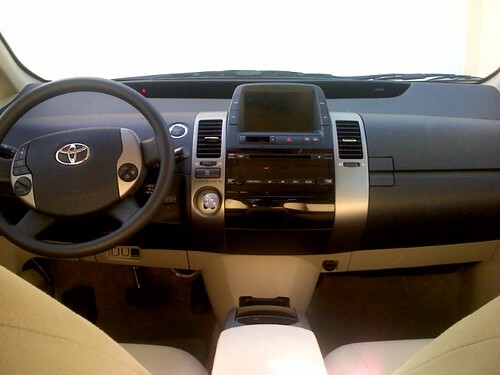 Since the PT is a manual transmission there is not the smoothness of the Prius which has a continuously variable drive system that has no shift points. 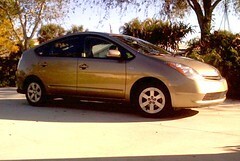 If we had to make a choice on the spot between the PT and the Prius the Prius would win hands down on many points. Towing with the RV would be an area where the PT would win for ease of hook up. The PT is hooked to the tow bars and put in neutral. The Prius would require the purchase and use of a front wheel dolly system. It cannot be towed with all four tires on the ground. I think we would still choose the Prius due to its economy, ease of use, smoothness, and quiet ride in spite of the dolly requirement. After a few days of hard city driving we are showiing 45.1 mpg. We have intentionally not been careful in our driving accelerating hard to get on the interstate and a lot of stop and go driving. This pattern is probably typical of about ninety percent of our driving. We like the car. It is functional and easy to drive. We still find the interior of this particular model plain. It is a rental car though and they usually have the most basic models. This particular car has about 23,000 miles on it and is solid and tight. Today is our last full day with the car so we plan on putting some more highway miles on it. We will probably take a short day trip somewhere just for fun. Finally, we find the controls on the center console and the radio cd player easy to use. Not fancy but functional. Actually using the display console to control the AC and fan is quite easy. Much easier than the more conventional mechanical controls found on other cars. 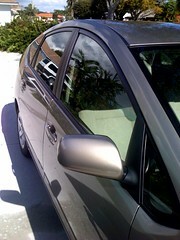 Our biggest complaint so far is the lack of tinting on the windows, an easy fix. We have spent the week running our normal errands around town, taking our granddaughter to her pre school, and not really trying hard for good mileage. At this point we have covered about a hundred miles of every day stop and go driving and our cumlative mileage is 45.6 mpg. We have become totally comfortable with this car and would probably be happy with a Prius except for one thing. To tow it behind our RV requires a dolly to get the front wheels off the ground. It cannot be towed with all four wheels on the ground due to the regenerative process that happens when the front wheels are turning. The car seats we used for transporting our granddaughters are easy to install in this car. My four year old granddaughter said that it is easier to see the road when riding in this car than when riding in her daddy's car. I guess that is an interesting viewpoint that I had not thought about and relates to the massive amount of glass in the Prius. One thing that we worried about was blind spots since our PT Cruiser has some bad ones. Probably the worst view out of the car in my opinion is the rear view as it is interupted by a spoiler bar across the back hatch. I think this may have been improved in the 2008 models. We are still having fun driving this hybrid and have a couple of more days left to enjoy it so we will keep reporting on our impressions. I did notice that Consumer Reports says that this car has the highest owner satisfaction of any they tested. Our weather has been fairly cool but one thing we both noticed is that there is a lot of glass on this vehicle. The windshield has a long flat aerodynamic shape but that also makes it a perfect solar collector. If we got one of these we would definitely have to opt for some serious windshield and window tinting. Either that or I will have to up my visits to my dermatologist to once a month instead of once every six months. 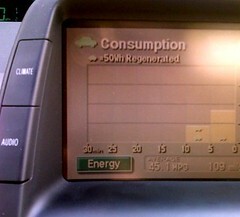 It is pretty easy to get comfortable with the technology in the Prius. Basically, you just turn it on and go. Nothing more complicated than that to worry about. It is all starting to seem very natural and the quiet smoothness is addictive. It is interesting that my initial impression was of confusion because of the vehicle's simplicity. That is a comment about how accustomed we are to complexity in our vehicles. Mileage has dropped to 42 mpg today. Never thought I would say my mileage had dropped to 42 mpg. More on Day 3 in another post. Finally a complete list of the top ten sites to debunk urban legends. If more people would refer to these before forwarding unfounded urban myths we would save a massive amount of bandwidth on the internet. Please, everyone, if anyone, who reads this, use these sites before forwarding stuff and if it is not true don't forward it.